Venezuela opposition leader Juan Guaidó calls for more protest as tensions grow. “I am not the attorney general. It will be the job of the attorney general, it will be up to the courts to determine the steps to follow, and we’ll see. This pertains to the justice system,” embattled Venezuelan President Nicolas Maduro told CNN during an interview on Sunday after a week of protest which saw opposition leader Juan Guaido proclaim himself as the interim President of Venezuelan, sparking a constitutional crisis and debate surrounding who the true leader of the county is. Maduro would accuse Guaido of violating “the constitution and all laws,” during the interview. Maduro believes Guaido, who is the head of the National Assembly is receiving backing from the United States and are acting as puppeteers while they direct the coup against him. “Nobody gives us an ultimatum, he said. “All of Europe is bowing down to Donald Trump. It’s that simple, especially when it comes to Venezuela,” Maduro responded when asked to comment on a Saturday ultimatum from France, Germany, Spain, and the United Kingdom who said they would recognize Guaido as President unless Maduro agreed to elections within the next eight days. 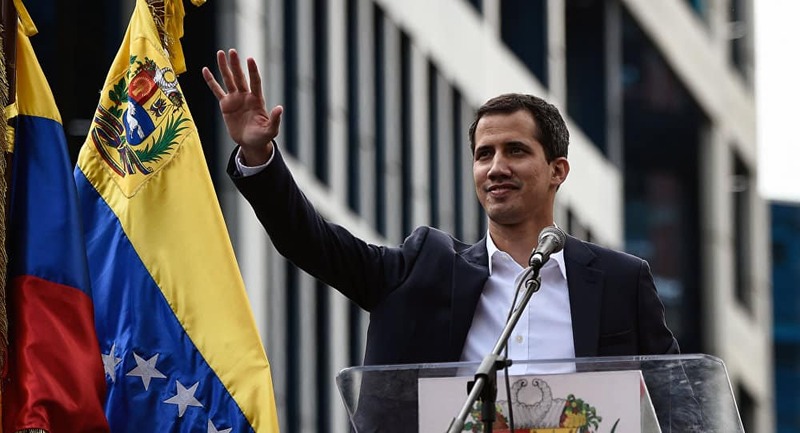 “Raise your right hand, today, January 23rd, 2019, in my condition as President of the National Assembly, invoking the articles of the Constitution – before Almighty God,” said leader of Voluntad Popular the Venezuelan opposition party, Juan Guaido said among his supporters. “I swear to formally assume the power of the National Executive Office as the President of Venezuela,” he continued. The ‘swearing in’ took place in the city of Caracas and remains the spotlight of the ongoing political turmoil in Venezuela, a country currently in the midst of regime change — drawing a line in the sand with President Nicolas Maduro of the United Socialist Party of Venezuela. Once considered the wealthiest country in Latin America, today, Venezuela is facing an unprecedented economic and political crisis marked by severe food and medicine shortages. Critics of the government and members of the opposition argue that Venezuela’s economic woes are the fruit of years of economic mismanagement, and corruption, but government supporters blame falling oil prices, international sanctions, and the country’s business elite for Venezuela’s troubles. When Maduro took over as president after Hugo Chavez’s death in 2013, the oil-reliant economy was already in trouble. When global oil prices dropped in 2014, businesses were no longer able to import goods at the same rate as before, skyrocketing prices and inflation. According to analysts, the contraction of the national and per capita gross domestic product (GDP) in Venezuela between 2013 and 2017 was more severe than that of the United States, during the Great Depression, or Russia, and Cuba following the collapse of the Soviet Union, heavily impacting the living conditions of millions. The situation in Venezuela remains contentious, especially with most of the military reportedly backing Maduro. Outlets have reported disputing numbers of how many have been killed since protests began, “A UN official said Friday that at least 20 people had been killed in protest-related violence last week, while the nongovernmental Venezuelan Observatory of Social Conflict on Friday pegged the tally at 29 since Wednesday night,” CNN reports. They also state over 350 protestors are now in custody. If tension continues Maduro could use his military support to violently suppress the uprising, similar to what the Iranian and Israeli governments have done consistently over the last five years, albeit at a smaller scale than what could occur if Maduro goes down that path.